Halloween Trick-or-Treating outreach from 3-5:30pm this Monday. 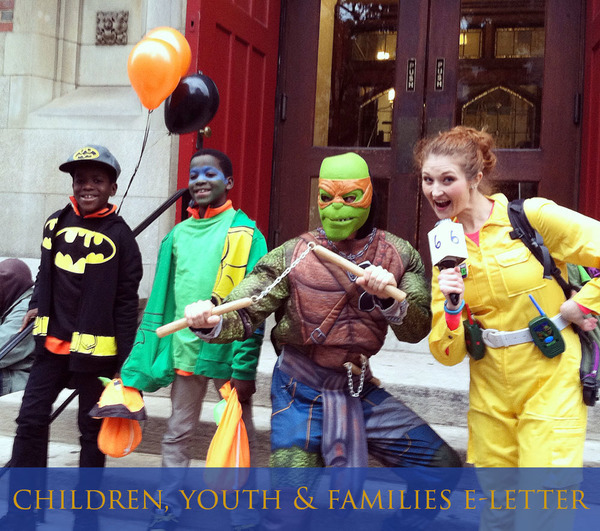 Help us hand out Halloween candy on Broadway and connect with new families. We'll be collecting contact info and sharing information about our programs with interested families. Flower Planting on 93rd Street from 2:30-4pm on Sunday, November 6. Not only is this a way to make our physical space "greener" and nicer looking, it's also a way to show families in our community that our families at Advent are learning about and participating in environmental stewardship. We'll have materials to help connect with and stay in touch with interested families passing us as we work. And lunch is included -- a delicious Congregational Lunch hosted by our Latino community is happening just before this from 1:45-2:15pm. Volunteer to bake treats or sell treats at our annual Christmas Cookie Sale (in tandem with our Christmas Tree Sale) on the morning of Saturday, December 3. Proceeds will support our Food Ministries, and we'll also have materials to share information about our family programs with any customers interested in learning more about Advent. Let's get out in the community, meet some new people, and invite new families into our faith community at Advent this fall/winter! Yes! I/My family can help at one of these events.